The BC Labour Heritage Centre Society preserves, documents and presents the rich history of working people in British Columbia. The Society engages in partnerships and projects that help define and express the role that work and workers have played in the evolution of social policy and its impact on the present and future shaping of the province. We are a registered non-profit society. 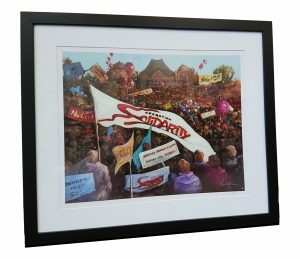 Click above to order a limited edition print of a painting by Fraser Valley artist Perry Haddock. It represents the historic events of 1983 when hundreds of community, faith and social justice groups united with the labour movement in BC to resist government attacks on us all. Proceeds to support the BC Labour Heritage Centre’s Projects Fund and the 35-year retrospective of Operation Solidarity and the Solidarity Coalition. by Rod Mickleburgh, published 2018. 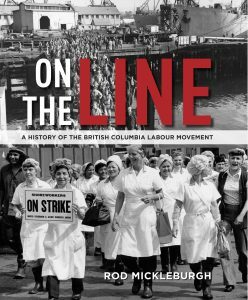 Read some of our latest research on BC labour history.